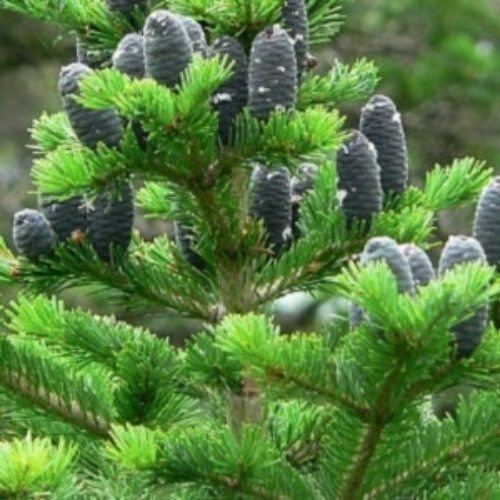 Abies sibirica, first described in 1833 by Carl Friedrich von Ledebour (1785–1851), is commonly known as Siberian fir, or as Пихта сибирская (pikhta sibirskaya) in the Russian language and as 西伯利亚冷杉 (xī bó lì yà lěng shān) in Chinese. There are two recognized subspecies: A. siberica subsp. siberica, the typical species which is described here. A. siberica subsp. semenovii which is confined to Kyrgyzstan. Please see this link for more information. Description. 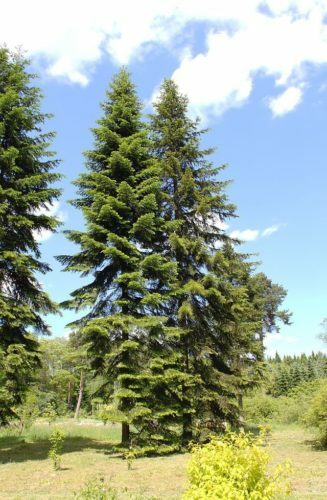 Siberian fir is an evergreen coniferous species of tree which will grow to heights of 100 to 112 feet (30 – 35 m) tall with a trunk measuring from 1.5 to 3 feet (0.5 – 1 m) in width at breast height and a conical crown. The bark is gray-green to gray-brown and smooth with the resin blisters that are typical of most firs. Shoots are yellow-grey, resinous, and slightly pubescent. The leaves are needle-like, 0.8 to 1 inch (2 – 3 cm) long and 0.12 inch (1.5 mm) broad on average. They are light green above with two grey-white stomatal bands underneath, and are directed upwards along the stem. They are soft, flattened, and strongly aromatic. The seed cones are cylindrical, 2 to 3.8 inches (5 – 9.5 cm) long and 1 to 1.4 inches (2.5 – 3.5 cm) broad, with small bracts hidden by the scales. They ripen from bluish to brown or dark brown by mid-autumn. The seeds, 0.28 inch (7 mm) long with a triangular wing 0.28 to 0.5 inch (0.7 – 1.3 cm) long, are released when the cone disintegrates after maturity. It should be noted that this tree rarely lives over 200 years due to its susceptibility of fungal decay in the wood. Distribution. This species is native to China — Xinjiang province; Kazakhstan; Kyrgyzstan; Russian — Altay, Amur, Buryatiya, Chita, Irkutsk, Khabarovsk, Krasnoyarsk, Tuva, western Siberia, and Yakutiya. 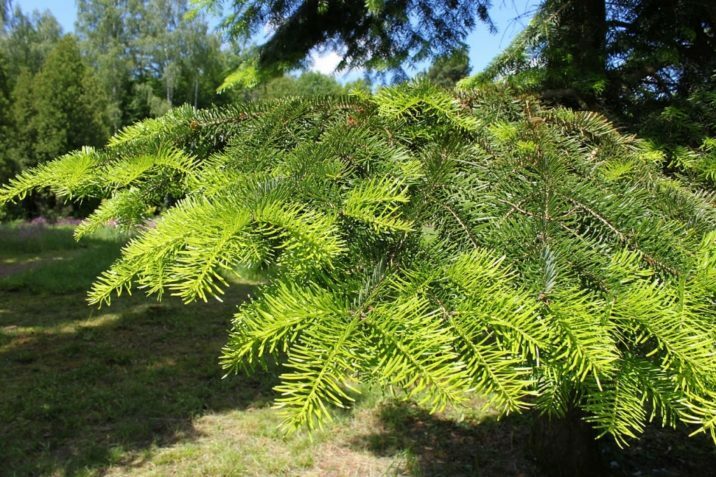 The tree lives in the cold boreal climate on moist soils in mountains or river basins at elevations of 6,000 to 7,700 feet (1,900 – 2,400 m) above sea level. It is very shade-tolerant, frost-resistant, and hardy, surviving temperatures down to -58°F (−50°C), making it one of the hardiest known trees. Abies siberica — foliage and seed cones.